Prostate cancer treatment in India – A personal experience..
“Cancer” the word itself strikes fear. We hear it happening all around and somehow think we and our near and dear ones are impervious to it. ….and then it hits you or a family member out of nowhere. In our case my father who had just turned 60 few months back was diagnosed with Prostate Cancer in Jan 2014. No symptoms, no health issues just underwent routine health checkup and he was diagnosed with elevated PSA of 24. A rectal biopsy followed which confirmed the cancer with a Gleason Score of 3+4. Our search for a doctor along with state of art medical facilities led us to Dr. Gagan Gautam at Medanta. At the time we were evaluating Surgery vs. Cyberknife (a focused radiation based approach where prostrate is not removed). We first fixed an appointment with Dr. Gautam and four of us literally spent close to 2 hours with him asking him questions and discussing the whole thing. The patience, grace and humbleness with which he attended to us and assuaged all our fears was really amazing. My Father (actually the whole family) was completely sold on the idea that he should be our doctor and that if surgery is to be done then he is the doctor who should do it. We shelved our Cyberknife plans and decided to undergo simple and effective RARP surgery through Dr. Gagan. On the appointed day my Dad was taken in for surgery around 7 am and was wheeled back to his room by 3:30 pm. We spent a total of 3 nights in hospital and were home just around lunch time on day 4. My dad had his catheter removed in exactly a week’s time. His first month PSA was less than .02 which indicated the disease was controlled via the operation. 3 months down the road he does not use pads; his urine control is good, enjoys playing with his grandson and drives himself 25km one way to his work. I don’t think we could have asked for anything more. All thanks to Dr. Gagan Gautam. We decided on RARP because it was the latest treatment, less painful (only 5 holes ), has been in practice for close to a decade, recovery after surgery was fastest and chances of my dad having normal life like before were the best. Plus we did not want to keep the infected organ inside the body considering the age of my father, hence Cyberknife was a ruled out. Cancer is a complicated disease and my father did have some lymph node spread as shown by the final biopsy which is done on the removed organ and tissue, thankfully the margins were clear. Also, the staging of cancer tends to change what started as 3+4 Gleason score for us was finally a 4 +4 after the final biopsy (cancer staging changed as well). In course of cancer treatment there will be good days, bad days and even more bad days, I think best we can do is to keep having faith and positivity. After God’s will, I attribute my Dad getting well to not only a highly skilled doctor, but also his own resolve and will to get better. Recovery after robotic surgery for prostate cancer – What to expect? These are some very practical questions that I am asked almost everyday during my initial counsel ling sessions with gentlemen who have been diagnosed with prostate cancer and are considering robotic prostatectomy (robotic surgery for prostate cancer). Fortunately, the answers to these common questions are almost always better than what they expect to hear! Robotic surgery has had such a positive impact on postoperative recovery that it is sometimes hard to believe that it still is ….and will always remain…. a major cancer operation. When I talk to my patients about this, I just tell them the sequence of events that they are likely to go through before, during and after the surgery. I tell them that there is a 95% chance that they will be able to stick to this pathway. Roughly, a 5% chance does exist, for having some problems or complications during the recovery phase. However, the vast majority of these can be managed effectively, albeit, with extra medications or procedures and hospital stay. You will be admitted to the hospital the evening prior to the date of surgery. In some circumstances you may be asked to come in the same day early in the morning. Before admission, all the relevant investigations are reviewed and a clearance for surgery is taken from the anesthesiologists. This is called the pre-anesthesia check up or PAC. At this time, if necessary, further advice and clearance may be sought from other specialists like cardiology, endocrinology etc. This is to ensure that all potential risk factors are assessed and mitigated prior to the surgery. This is done with the sole intention of keeping you safe during and after surgery. The night before the surgery you will be provided a normal dinner and some medications to help you have a relaxing sleep before the day of the surgery. You will be asked not to eat or drink anything after midnight and will be requested to sign the consent form for the operation. You will be moved to the preoperative holding area about an hour prior to the time of surgery. Here you will receive antibiotics to decrease chances of infection and will be reviewed by anesthesiologists. You will then be moved to the main operating room and anesthesia will be administered. 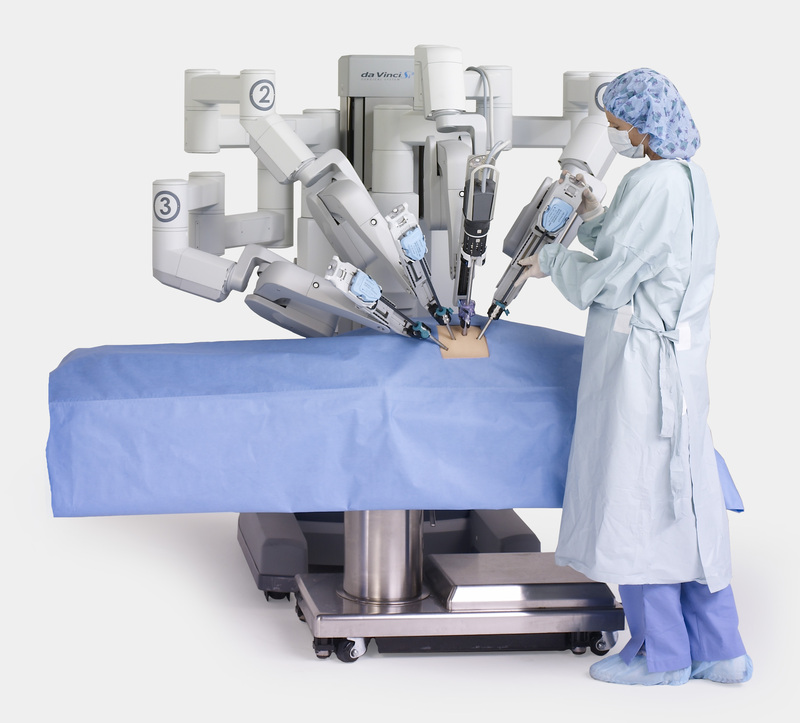 Robotic prostate cancer surgery, on an average, takes about 3-4 hours to complete. After surgery, your surgeon will meet your next of kin and provide them with information about your surgery and expected recovery. You will be able to meet your loved ones in the post operative recovery room after 1 or 2 hours when you have recovered from the effects of anesthesia. Thereafter, you will be moved to your room. You will be able to have a full liquid diet starting 4 hours after the completion of your operation, although some fluids will also be given intravenously for support. You will be encouraged to move all your limbs and do deep breathing exercises. You would be expected to be reasonably comfortable with the help of painkillers that would be administered to you. At this time you would have a urinary tube and a thin abdominal drain to remove fluids from the body. On the day after the operation, you will be served a normal diet for breakfast and intravenous fluids will be discontinued. You will be encouraged to walk about outside your room for a total of 60 minutes during the day, in splits of about 10 minutes each. The abdominal drain will be removed and medications tapered down. Deep breathing exercises (incentive spirometry) and steam inhalation are very important components of your ‘home work’ on this day. This keeps your lungs healthy and prevents infection. You should be quite comfortable with the help of medications. This is the day you go home! You will be relatively pain free such that you can manage easily on oral medications, without the need for any injections. Your confidence in moving about and doing all your daily activities should be back. You can take regular meals, travel in a car, go for a walk and climb stairs. You can also take a shower on this day. You will be discharged with clear instructions on how to manage the urinary tube, which would be removed after 1 week. You will be prescribed some medications to ease your visit to the washroom and to keep you comfortable. Although you would likely have passed some wind by now, passage of stools may take another day or two in the course of a normal recovery. You will be asked to come into the hospital and stay there for 3 – 4 hours in the daycare ward. Here your urinary tube (catheter) will be removed. You will be taught pelvic floor exercises (Kegel exercises) to promote early recovery of full urinary control. You will be advised on the proper use of continence pads, water intake etc. and sent home on the same day after you have comfortably passed urine a few times. If the pathology (biopsy) report from the surgery is available by that day, your doctor will discuss the findings with you. After this time, you should be well on your way to a full recovery. You can rejoin your work in about 2 -3 weeks. Most men are comfortable enough to start driving around the same time. You will likely have fully recovered by now, except that you may be needing a couple of pads to control leakage. Even this is likely to rapidly improve in the coming few weeks. You should get your first PSA test 1 month after the day of your surgery. This will give you and your doctor an excellent idea about the control of the disease and the chances of requiring further treatment, if any. You will need to be in regular follow up with your doctor to ensure that you remain trouble free. Initially it will be once every 3 months. As the years go by, you are likely to require a visit to the clinic only once in a year. I hope that you found this blog useful. I wish you a speedy recovery! Dr. Gagan Gautam is the head of robotic surgery for prostate, kidney and urinary bladder cancer at Max Institute of Cancer Care, New Delhi, India. Besides being one of the leading specialists for prostate cancer in India, he is also an expert in nerve sparing robotic prostate cancer surgery, which has been shown to result in a faster recovery of urinary control and potency after prostate operation. To know more about him, please click here or visit his website http://www.roboticsurgerydelhi.com. To read a patient’s first hand account on the experience of undergoing robotic prostate surgery, please click here. To contact Dr. Gautam or to seek an appointment, please click here. To view his video on robotic prostate cancer surgery, please click here. To read his blog on the cost of prostate cancer treatment in India, please click here. To read his blog on robotic prostatectomy, please click here. To read his blog on watchful waiting and active surveillance for prostate cancer, please click here.